Well, we were expecting to have an awful lot to do in this one day, in order to get ready for a steam test tomorrow … When I arrived at 10.00, all of the inspection hole plugs had been fitted; all of the mud-hole doors had been fitted; even the grate had been replaced in the firebox. I suspect that someone had been very busy yesterday … possible until late in the evening? David came expecting to be hard at it all day, and couldn't find anything to do, so he painted an oil can. So expertly was it finished, that he was given a second one to paint! 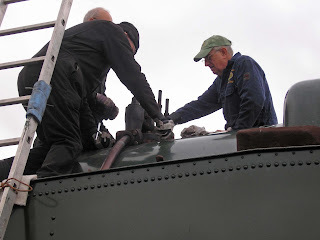 John T and Bruce started fitting the safety valves, and David joined in on that. 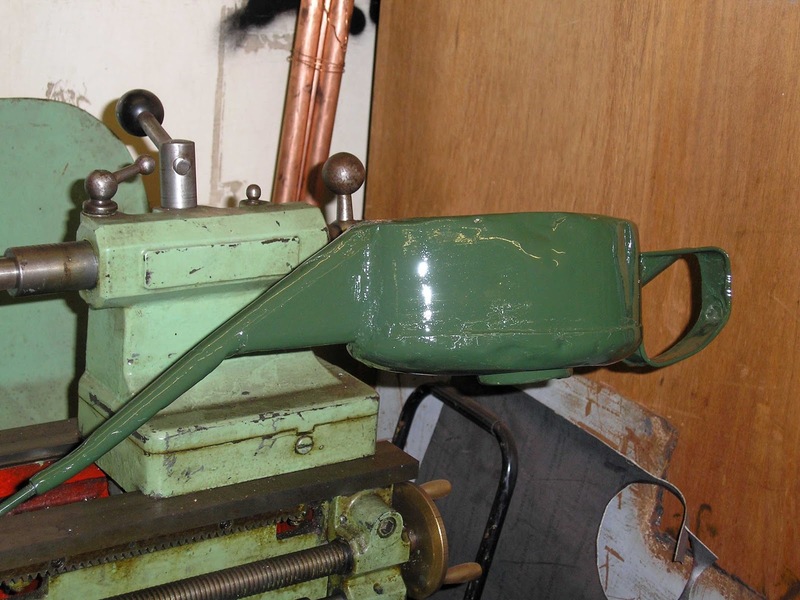 Note the spacer wedged in above the spring - this is to stop the tightening at the point at which the valve blows off at the correct pressure (or not, as the case may be). The rest of us were almost at a loss knowing what to do! 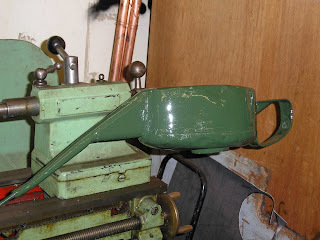 Gilbert fitted the ferrules round the plugs in the cab, and replaced the small section of floor. I put the kettle on! Carpo popped into the TPO to tell us that the boiler inspector was most impressed with our loco on Monday; gave it a clean bill of health, and gave his opinion that the boiler was good for lasting out the 10 year 'ticket'. Good news. At 11.00 we held a 2 minute silence in the TPO (apart from the noise of the kettle). John G tackled the rail chairs, applying an enamel top coat to 8. John T assembled the gauge frame (in the cab) and fitted it. 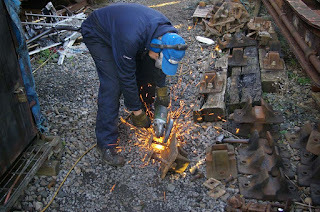 At this stage, the boiler was filling with water, and John H [Loco Dept] was keeping an eye on the level for us. Having just about run out of things to do, Bruce offered to lap-in the safety valves on 4270. His offer was eagerly snapped up! David then assisted Bruce, and once lapped, they fitted the valves. After lunch, I watched over John H and Martin C [both Loco Dept] as they carried out all of the pre-lighting checks and then lit a warming fire in 2807. 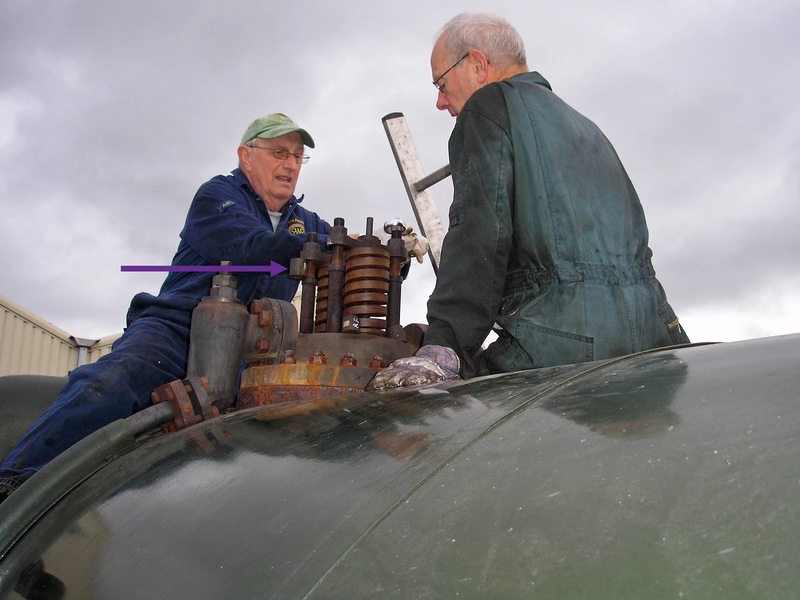 David had previously taken an oil can home to re-solder where it had been leaking. Today, he ended up taking another one home to repair similarly! John T ran out of things to do, so cut off bolts from some of the rail chairs in the pile. John G noticed that the Flag & Whistle had only one boot scraper left on the trolley, so he & I restocked that. Bruce & David discussed various options for replacing the copper pipe between Y-splitter and condensing coil, where there is a very sharp bend (that has now split). Looking at that in 4270, the Y-splitter is fitted directly onto the steam fountain (aka header), whereas ours has a sort-of adapter between them (hence making it closer to the cab roof, with less room for a comfortable bend in the pipe). Martin C & John H banked up the fire, and we called it a day. Thursday is planned to be a steam test. Assuming all goes well, 2807 will be in service on Friday and Saturday conveying race-goers twixt Todders and Cheltenham. So, there will be nothing (much) for us to do on Saturday, but next Wednesday we will position her in the shed ready to commence winter maintenance … and address the pony truck enigma!